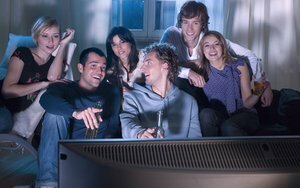 National TV advertising sales upfront deals look to rise, on average, by 10% in the cost per thousand viewers with total dollar volume growing mid-single-digit percentages -- the first time there has been overall growth in three years. Though the upfront process has yet to be completed, media consulting company Media Dynamics says national TV networks are looking at a 4.5% rise, or $800 million, to land at $18.61 billion -- $9.86 billion for cable networks and $8.75 billion for the broadcast networks. It is the first time the upfront TV market has seen a gain in dollars since the 2013-2014 upfront selling period. In the two previous years, the upfront market witnessed declining dollar volumes of 3.0% for the 2015-2016 TV season and 4.4% in the 2014-2015 TV season. Upfront dollar volume for the coming season is back to near levels seen for the 2012-2013 TV year, when estimates totaled $18.67 billion. CPMs, the cost per thousand viewers, has climbed around 10% so far, according to Media Dynamics estimates -- to an broadcast network average of $47 for prime time adult 18-49 viewers, compared to $43 for the current season. Cable’s network CPMs are estimated to be $31 for next season versus $29 for 2015-2016. Much of traditional TV networks rise in upfront dollars this year has to do with advertisers concerns over digital media in terms of “visibility” of commercials -- including ad blocking technology. Ed Papazian, president of Media Dynamics, says this has slowed some digital media buying. 8 comments about "National TV Upfront Rises For First Time In 3 Years ". Leonard Zachary from T___n__, July 13, 2016 at 2:35 p.m.
Ed how does your set of CPM numbers translate to ARPU per household???? Ed Papazian from Media Dynamics Inc, July 13, 2016 at 4:18 p.m.
ARPU refers to the average revenue per subscriber but there is no such calculation in the case of broadcast TV or cable as there is no comparable subscriber base. The broadcast TV networks, in effect, cover the entire country, less a small number of TV homes ( 3% per Nielsen) that are broadband-only and don't have a TV set. The basic cable channels are not subscribed to on an individual basis but are bundled into multi-channel packages on a take it or leave it basis. So most of them cover 85-90% of U.S. TV homes, even though many homes rarely tune in. Generally speaking, you must take into account the declining average minute ratings per seller as well as the number of announcements sold and the cost per "viewing occaison" for every thousand viewers reached ( CPM ). If there were valid subscriber bases for broadcast TV and cable, this would, no doubt, result in a steadily increasing ARPU, providing that total ad spending remained at fairly high levels or increased at a modest rate. Setting aside the definition of "subscribers" if the overall TV universe remains roughly constant at around 116 million homes and advertisers spend $ 3-4 billion more next year to reach viewers the ARPU for "linear TV" as a single national entity goes up. Leonard Zachary from T___n__, July 14, 2016 at 12:47 p.m.
Ed Papazian from Media Dynamics Inc, July 14, 2016 at 12:57 p.m.
Obviously if the amount of ad revenue taken in----which is not necessarily indicated by CPMs----rises while the number of "addressable" homes remains about the same, than the "ARPU" would increase. Anyone familiar with media should already know that. Yikes! Double Yikes!! Leonard Zachary from T___n__ replied, July 14, 2016 at 1:39 p.m.
Ed Papazian from Media Dynamics Inc, July 14, 2016 at 2:46 p.m. When hippos learn to fly then baboons will begin to drink buttermilk. John Grono from GAP Research, July 20, 2016 at 9:48 a.m.
Leonard, CPM and ARPU are COMPLETELY different and you are demonstrating either lack of knowledge or lack of experience. CPM is the ADVERTISING cost divided by the audience 000s. It is an ADVERTISING efficiency metric by demographic. Each ad has a different CPM. And that ad's CPM is different for each demographic. CPM is used primarily by media agencies. ARPU (in the main) is the Average Revenue Per Unit where a 'Unit' is basically a household (which may be multi-set/multi-STB) and the revenue is SUBSCRIPTION revenue. It is a subscripton/sales metric. It has no demographic profile to it (but that can - and maybe should be - calculated). It does NOT take into account any audience measurement. It is the average SUBSCRIPTION cost across the installed homes. So how you concluded that Ed has confirmed ARPU for a broadcaster defies all logic. Put the cue in the rack. Ed Papazian from Media Dynamics Inc, July 20, 2016 at 10:19 a.m. Thanks, John, but I fear that in this case it's hopeless to attempt to explain the obvious to those who don't even know the basics and see no reason to learn.